Balance, Duality, Oneness. Those three words capture the essence of our approach to jewelry design. Terry and Jeanne spent their earlier years developing careers in engineering technology and social science. In our pursuit of a more contemplative lifestyle, we moved from the big city, to a small town in the Pacific Northwest. What began as a few innocent beading lessons from a friend, has become a passionate interest for the two of us. Now we make beautiful jewelry that hangs like art in a gallery…and jewelry that symbolizes the higher aspirations of the human spirit. We see jewelry as the perfect medium for us to create symbolic emblems representative of of people’s values and identity, and to enjoy the artistry and technical process involved in bringing it about. 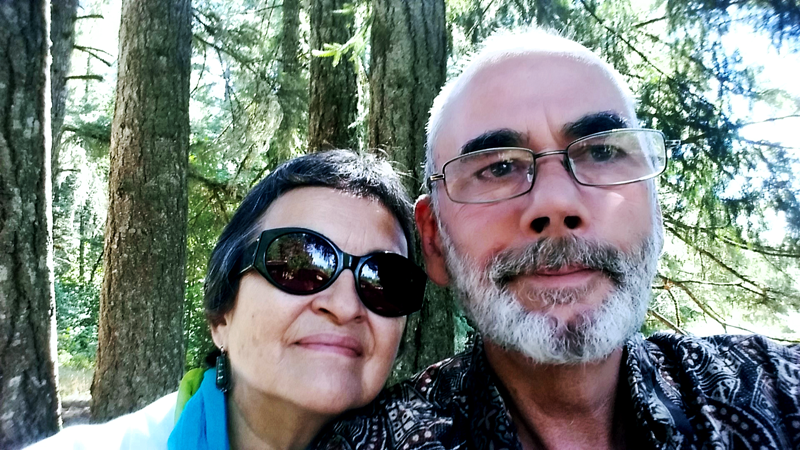 Jeanne & Terry Orr selfie in the woods. Half Full Designs derives it’s name from the age old philosophical question… is the cup half full or is it half empty? The full spectrum of the color wheel encircles the perimeter of the Half Full logo suggesting infinite diversity within oneness. Balance, Duality, Oneness. We create custom designs; so if you see something that is close to what you want or have an idea of your own, email us at jeanne@half-full.rocks or terry@half-full.rocks and together, we will co-create your vision. Our custom metal jewelry is produced using traditional lost-wax casting methods from a plaster mold. We use 3D printing technology to create the original wax model. For custom requests, we can work from a concept drawing. Sometimes, even just a description of your idea is sufficient to begin the process of turning your special idea into a beautiful jewelry creation! Gemstones have been attributed with subtle qualities since ancient times and have been used in rituals and ceremonies around the world. Gemstones are still highly regarded in modern times, not only for their beauty, but for therapeutic applications as well. Whatever it is about a gem that makes it meaningful to us, it is important to care for it. Do not use silver cleaning dips for vintage jewelry. Cleaning agents are often comprised of very strong chemicals that will remove antiquing and destroy the value of a piece of antique jewelry. Chemicals also are deleterious to most types of natural gemstones. Avoid using cleaners or harsh chemicals as they may alter the color of your gem stone. Avoid getting makeup, perfume and hairspray on your gem stone jewelry. Avoid using ultrasonic cleaning machines with gemstone based jewelry, since the microscopic vibrations may damage brittle gem stones. Never store gem stone jewelry exposed to any forms of diamond jewelry; diamonds may scratch the softer gem stones. Having your gem stone jewelry professionally cleaned and serviced annually is optimal. Use a professional jeweler to repair your gem stone jewelry. Between professional cleanings, soak gemstone jewelry in warm, soapy water for several minutes and use a soft, non-metallic brush to remove dirt and grime. Always clean gem stone jewelry in a bowl and not directly above your sink to eliminate possibilities of losing it down the drain. Store your gem stone jewelry pieces separately in tissue or cloth and in separate compartments of a jewelry box. The original boxes or packages that come with the purchase are usually the best ones for storage. Remove your gem stone jewelry when doing housework, cleaning, gardening or any form of heavy chores. Chemicals can harm or ruin your gem stone… including beauty salon treatments where the contact of chemicals is inevitable. Have safety chains or safety clasps installed on your more expensive or sentimental jewelry pieces.